Thanks to all those wonderful people who have written such nice comments about us over the years, we hope to see you again soon. If you have general comments, questions or would like to submit a testimonial click here. NE Clam Jams catered a 30th birthday party this past weekend. People whose ages ranged from 64-18 attended and everyone raved about the food. Lyn had wonderful ideas when we told her what we wanted to do and the evening was perfect. I will be using Lyn and her crew from now on, and although I'd love to keep it a secret, I won't! Everyone should know how amazing this is!! Thank you for the most delicious touch to our evening. NE Clam Jams catered my rehearsal dinner and did an AMAZING job. The lobster was juicy, tender and sweet - PERFECTLY cooked. One of the best I have ever had. It went along with local steamers, delicious homemade cornbread and the most lovely, sweet staff. Cannot recommend them highly enough!! When it comes to a caterer, Lyn is the best! From our first consultation, Lyn understood our vision for a home-style elegant family style dinner. Not only is her food AMAZING but most importantly, her staff is top-notch! Our guests complimented that we had the best food of ANY wedding they had attended. Her raw bar is the best, and her famous chowder served with lemon cornbread is my favorite. I wish we had added her tomato salad - but we didn't want to stuff our guests into a food coma. Many thanks for the wonderful Clam Jam which you so successfully presented to us last friday at the Acoaxet Club. All of the MBA students from Columbia Univ. commented on how great it was ... most had never been to an authentic New England spread like that before. Thanks so much to you and your staff for providing such wonderful food and pleasant service during our Preservation Leadership Reunion during the National Preservation Conference in Providence. It was the best party we've thrown yet and we couldn't have done it without you. Thank you very much for the wonderful job you did at our farm. Your presentation as well as quality food made for a terrific party. Many compliments, no complaints. Many, many thanks for your delicious raw bar and warm and friendly service! Everyone is raving about the evening and your Clam Jam operation. Thank you so much for the wonderful evening. Your service, professionalism and friendship is greatly appricated. I just can't tell you what a special evening you made for all of us. Thank you for the wonderful job you and your crew did for my mother's 80th birtrhday. The food was perfect; the service impeccable. We couldn't ask for more. I would like to thank you for the wonderful dinner that you provided for our sales meeting. Everyone raved about how delicious everything was, especially the lobsters of course! May I add my thanks to everyone else's for the most spectacular clambake we have ever attended. For many of our guests it was their first – my eighty year old aunt was thrilled to finally go to a clambake. The food was all delicious. There were lots of things to try and old favorites as well. It was beautifully organized and presented by attractive servers (including Kate). You are the BEST! You all exceeded our expectations – we have you all on video, working from 4 - 10 with super service and hospitality. We are getting thank you notes from our guests on how wonderful the food and crew were. I would like to thank you for the skill and effort you put into making our party a success. Everybody enjoyed themselves tremendously! Many of our guest commented on the interesting menu, the freshness of the seafood, and especially on how accommodating and knowledgeable you and your staff were. As anticipated, the clam bake was wonderful. The chowder was fantastic, as was the chicken. You certainly have earned our enthusiastic recommendation. As usual, everything was wonderful and you and your staff did an excellent job. Everyone was thrilled with the raw bar and chowder. We wanted to thank you so much for making our wedding reception a very memorable and wonderful experience. You and your staff did an outstanding and professional job. We can't tell you how many complements we have heard – especially about the raw bar – VERY IMPRESSIVE! Our sincere thanks for the very generous contribution you and your stfff made to WHALE's "Revelry for Revere" fund raiser. The raw bar was the absolute hit of the evening. For the second year in a row I am sending you a letter of thanks for helping make the Aerovox Clambake on September 11, 1994 a great success. The food was outstanding, service was prompt and professional and the raw bar was especially a big hit. 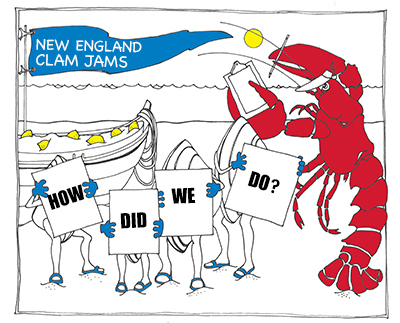 On behalf of the Achushnet Company Rubber Division and all the attendees I want to thank you and your staff of the New England Clam Jams for a very delicious clam bake. The service was very professional and the meals were enjoyed by all.